Join the discussion on our forums! Come discuss Twisted Worgen over in our dedicated Twisted Worgen discussion topic. Druid of the Saber is better, but it's also a class card. This is still pretty solid. Goes for face over and over again. Oh yeah, I forgot about that card. You are right. Basically a Druid of the Saber for all classes. Not bad. 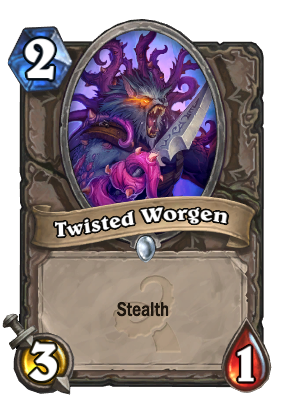 It's hard to live up to Worgen Infiltrator, but this is a solid aggro card.